Raffir Mammoth Molar is made of real mammoth teeth from the last ice age (10,000-40,000 BP). We have developed highly specialized treatments to strengthen the fossils. As a result, such fragile materials are finally useful for unique luxury products. It is popular in a wide range of fine crafts and unique products. It is very useful for fine handles, jewelry and inlays. But we also recommend it for many other precious small-sized objects. The natural colors of mammoth molars vary from piece to piece. Some are lighter while others are darker. But anything from cream white to dark brown are found. Other, more rare pieces have different brighter colors. We can also add color when we stabilize them. Normally, we stabilize in natural, black or blue color. Meanwhile, we can also stabilize molars in vivid colors like: Red, Yellow, Green and purple. 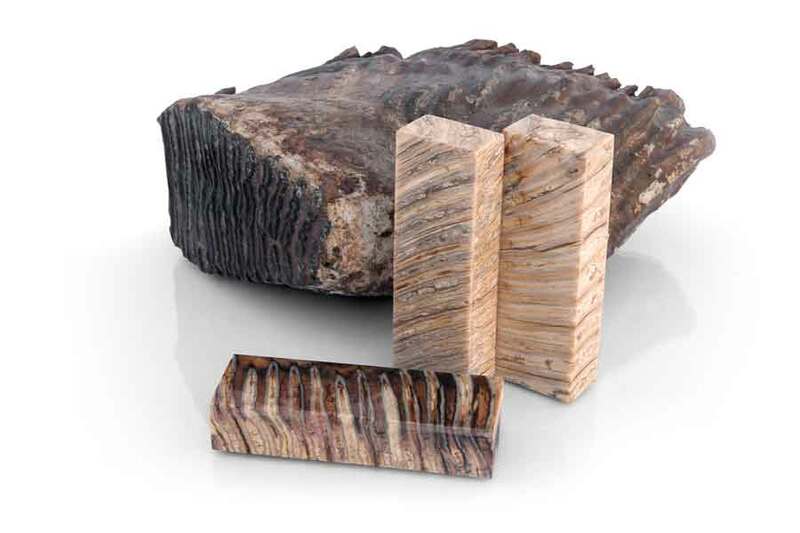 Woolly mammoth teeth grow in layers of three different materials. The first is dentine, which is the regular tooth material that most animals have. The second type is enamel, which is harder. At last, cementum is the third layer that binds the other two together. Because of these different layers the patterns also differ a lot depending on cutting direction. We usually cut them in the cross direction (XC) of the layers. This is the most common and popular cut, which gives the characteristic stripes across the blocks/scales. We can also cut them parallel to the layers (YZ), which gives very different organic patterns. However, only few of the molars are large enough to cut handle or bigger blocks in this direction. Finally, we can cut them across the layers in the length direction (ZC). Meanwhile, this is also more rare because it requires bigger molars. The mammoth teeth are not yet petrified. Although, they do contain natural minerals and are harder to work than non-fossil material. Mammoth molar is also the hardest of the three mammoth fossils because of its enamel layers. Therefore we recommend diamond tools. Alternatively, use tools for hard steel at low processing speed, if diamond tools are not available. We also recommend saturating the surface of the material with cyanoacrylics (Super Glue) after grinding it. Then fine-sand and polish it to achieve a smother and stronger result. The dimensions depend a lot on the input material. The raw molars all have different shapes and sizes. Thus, the product sizes are also limited to smaller objects. Our standard handle blocks are 120*40*25mm. We also cut scales pairs of 120*40*6mm. Meanwhile, the material mainly comes in non-standard dimensions. So check our retailers for their current availability. Otherwise please contact us for special requirements.